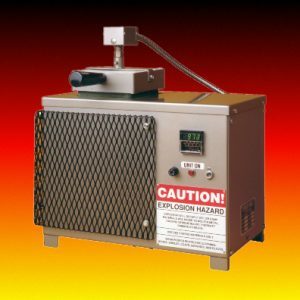 If you’re looking for the ideal furnace to use in jewelry or hobby work or just wish to teach foundry on a small scale, the E4-0 Electric Bench Top Melter is for you. All the quality and performance of our largest melting furnaces has been engineered into an electric melter especially designed to receive a #4-0000 crucible. Because of it’s table top size and affordable price, the hobbyist can now enjoy the versatility of casting his own parts. Accessories available for use with this furnace include 4-000 bent handle tong, 4-000 crucible, P3 crucible, 3″x4″x2″ flask, 5″x7″x2″ flask and a mini ingot mold tray- see our online store. Like the E4-0 described above, the EM-810 melter is an excellent choice for the small jewelry manufacturer, laboratory, hobbyist, or educational environment. It features the same rugged construction and dependability found in all MIFCO products. 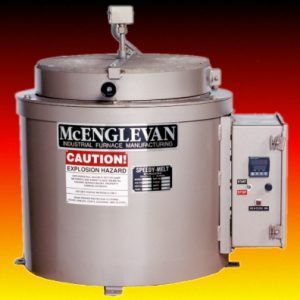 The EM -810 is capable of melting most non-ferrous metals with a maximum chamber temperature of 2050F and is controlled by a digital temperature control instrument. All controls are solid state for long life and dependability. Heating elements are cast into a ceramic fiber tube, making element replacement quick and easy. The heating chamber is backed up by 2 inches of high temperature, fiber blanket insulation. The EM-810 accepts either a number 8 or 10 standard bilge-type crucible. The unit will fit on the optional Pouring Cart pictured with the unit, which places the furnace at a convenient height for removal of the crucible. The Pouring Cart is equipped with locking wheels for added safety and facilitates easy storage of the unit after melting. The EM-810 is available in 240 volt, single phase and is equipped with a plug and 15 ft. power cord. 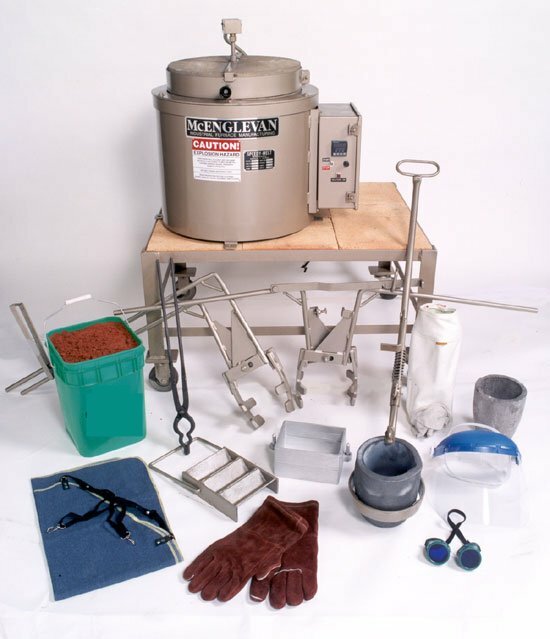 MIFCO has all the accessories you will need to start melting and casting metal with your new Bench-Top Melter. Shown at left are one and two person lifting tongs for removal of the crucible from the furnace, a one person hand pouring shank (two person available), charging tongs and a crucible. We also have 35 lb. buckets of pre-mixed, oil bonded foundry sand, cast aluminum and steel flasks, and ingot molds. Also shown are some basic items of protective clothing; apron, leather welder’s gloves, leggings, goggles and a face shield. We also sell an extensive line of high temperature resistant protective clothing that can be seen in our online store. The pictured items, less the cart, are available in two packages – one for aluminum melting and one for brass melting, Items will vary within each package. The items are also available separately. The optional portable cart (410200) measures 25″ deep x 37″ wide x 21″ tall and MUST BE ordered separately.